William Saroyan was an American author who wrote many plays and short stories about growing up impoverished as the son of Armenian immigrants. These stories were popular during the Great Depression. Saroyan's stories celebrated optimism in the middle of trials and difficulties of the Depression. Several of Saroyan's works were drawn from his own experiences, although his approach to autobiographical facts can be called poetic. 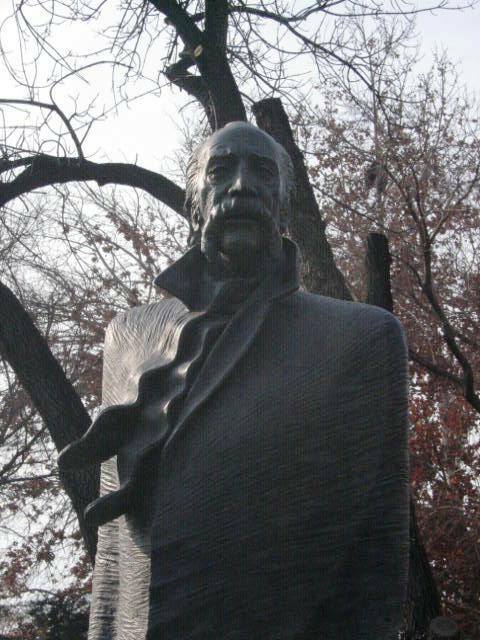 To celebrate the 100th anniversary of William Saroyan's birth, in November, 2008, a monument to him was unveiled in Yerevan on the corner of Moscovyan Street and Mashdots Street. The statue is the work of architects Ruben Hasratyan and Levon Igityan. Sculpted by renowned sculptor Davit Yerevantsi, it was the brainchild of Rafael Hovhannisyan, President of the Pan-Armenian Geographic Association. The project was supported by Armenian benefactors form the Diaspora and government funding. Saroyan's monument stands next to a number of renowned figures 's Martiros Saryan, Aram Khachatryan, Komitas, Sayat-Nova, Yervand Kochar and Alexander Tamanyan. No one appeared here accidentally. “None of them lived in this world in vain”, as Saroyan would say.